Hey, I get it if you’re saying to yourself, not another post about that Proverbs 31 woman, that overachieving, superwoman that Christian woman aspires to be, even though, her example is difficult to follow. The virtuous woman is looked to as the standard of what a good wife, woman, and mother should be. I think she should be looked up to, women should want to be like her, but I’m afraid having her name plastered on, God knows how many social media bios, she has become somewhat of a cliche, and some women has had enough of her do-it-all-have-it-all message. Despite what many will lead you to believe, the virtuous woman isn’t a one size fits all model of a woman in her various life roles. She isn’t a mold you’re supposed to fit into or a template you are supposed to fill. She, not someone you are supposed to be, she something you are supposed to get. Ultimately, is a title given to a woman who has run this Christian race well–fearing God, fulfilling her responsibilities to her husband, her children, and her community. Instead of comparing yourself to this exemplary woman, which is toxic to your spirit, try looking for bits of her in your own life, you may find that you shine in some qualities of the virtuous woman and be completely void of others and that’s okay. Look for small practical ways to cultivate the qualities you lack. Don’t beat yourself you if you fail, fall or royally f@%! up. Pick yourself up, dust yourself off and keep at it. God will reward you for your faithfulness. If you desire to be a Proverbs 31 woman, with a heart to please God–not just using lip service for search engine optimization–skip other people commentary, read the scripture for yourself. 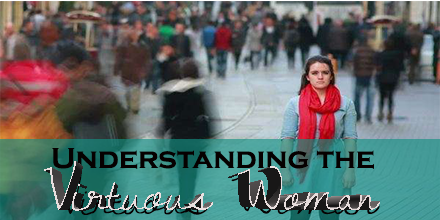 Pray and ask the Holy Spirit to open up your understanding of The Virtuous Woman. Then work on ways to apply what you learned to your daily life. How do you see the virtuous woman as the tangible–an example you have to live up to? Or, as the intangible, as I do- something given to those women who wisely and earnestly seek the prize of the virtuous woman? Do you see her another way? Are you tired of reading posts about Proverbs 31? Talk to me.